Plot Summary: Misaki Ayuzawa is the first female student council president at a once-all-boys-turned-co-ed school. She rules the school with a strict discipline demeanor, but she has a secret: she works at a maid cafe due to her family's circumstances. 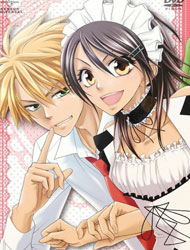 One day, the popular A-student and notorious heart-breaker Takumi Usui finds out her secret and makes a deal with her to keep it hush from the school in exchange for spending some time with him.